Quickly weigh incoming freight and stock with the Cardinal Detecto 8852F-205 1000 lb. portable digital floor scale! 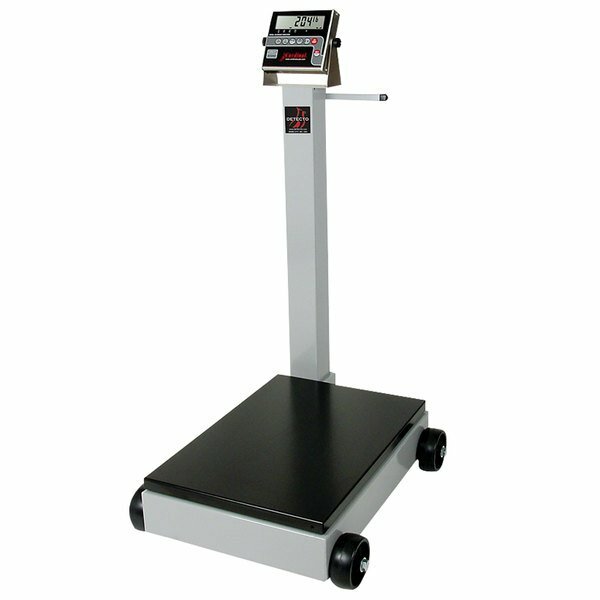 This digital floor scale features a 19" x 28" weighing platform and 1000 lb. capacity to accommodate large loads, while its large 5" heavy duty rubolene casters make it easy to move from place to place. It comes with a 2 1/8" tall 6-digit LCD display so you can easily read weights, and its zero, tare, gross, net, and low battery indicators show information in a simple way to help keep your business running smoothly. This indicator also includes Gross, Tare, and Net conversion functions make it easy to switch to and from metric units while its StableSENSE adjustable filtering and selectable key lockout provides reliable stability and security. For optimum versatility, this scale can cycle among pounds, kilograms, ounces, grams, or pounds/kilograms when in use, and its legal for trade classification means you can use this scale for bulk sales as well. And thanks to its heavy-duty steel construction, you can be sure this durable scale is designed for longevity. 440 kg. x 0.2 kg.